TEHRAN, Iran - Hundreds of Iranian school students bused in for the occasion crowded outside the former U.S. Embassy on Monday, burning American flags and chanting slogans to commemorate the 29th anniversary of the building's seizure by militant Iranian students. Equal parts day off from school and angry demonstration, the commemoration came on the eve of the U.S. presidential election and was marked by anti-U.S. and anti-Israel chants and the burning of American, Israeli flags and an effigy of Uncle Sam. Student followers of the Ayatollah Khomeini send shock waves across America when they storm the U.S. embassy in Tehran. The radical Islamic fundamentalists took 90 hostages. The students were enraged that the deposed Shah had been allowed to enter the United States for medical treatment and they threatened to murder hostages if any rescue was attempted. Days later, Iran's provincial leader resigned, and the Ayatollah Khomeini, the leader of Iran's fundamentalist revolutionaries, took full control of the country--and the fate of the hostages. Sixty-six Americans were taken captive when Iranian militants seized the U.S. Embassy in Tehran on Nov. 4, 1979, including three who were at the Iranian Foreign Ministry. Six more Americans escaped. Of the 66 who were taken hostage, 13 were released on Nov. 19 and 20, 1979; one was released on July 11, 1980, and the remaining 52 were released on Jan. 20, 1981. Ages in this list are at the time of release. Thomas L. Ahern, Jr., 48, McLean, VA. Narcotics control officer. Clair Cortland Barnes, 35, Falls Church, VA. Communications specialist. William E. Belk, 44, West Columbia, SC. Communications and records officer. Robert O. Blucker, 54, North Little Rock, AR. Economics officer specializing in oil. Donald J. Cooke, 26, Memphis, TN. Vice consul. William J. Daugherty, 33, Tulsa, OK. Third secretary of U.S. mission. Lt. Cmdr. Robert Englemann, 34, Hurst, TX. Naval attaché. Sgt. William Gallegos, 22, Pueblo, CO. Marine guard. Bruce W. German, 44, Rockville, MD. Budget officer. Duane L. Gillette, 24, Columbia, PA. Navy communications and intelligence specialist. Alan B. Golancinksi, 30, Silver Spring, MD. Security officer. 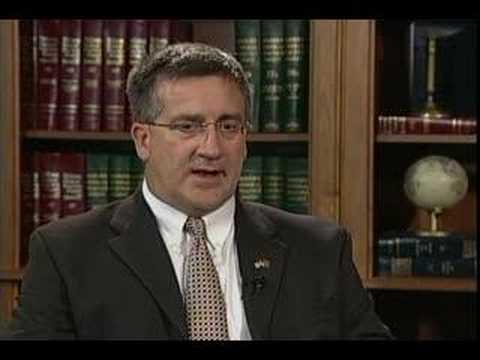 John E. Graves, 53, Reston, VA. Public affairs officer. Joseph M. Hall, 32, Elyria, OH. Military attaché with warrant officer rank. Sgt. Kevin J. Hermening, 21, Oak Creek, WI. Marine guard. Sgt. 1st Class Donald R. Hohman, 38, Frankfurt, West Germany. Army medic. Col. Leland J. Holland, 53, Laurel, MD. Military attaché. Michael Howland, 34, Alexandria, VA. Security aide, one of three held in Iranian Foreign Ministry. Charles A. Jones, Jr., 40, Communications specialist and teletype operator. Only African-American hostage not released in November 1979. Malcolm Kalp, 42, Fairfax, VA. Position unknown. Moorhead C. Kennedy Jr., 50, Washington, DC. Economic and commercial officer. William F. Keough, Jr., 50, Brookline, MA. Superintendent of American School in Islamabad, Pakistan, visiting Tehran at time of embassy seizure. Cpl. Steven W. Kirtley, 22, Little Rock, AR. Marine guard. Kathryn L. Koob, 42, Fairfax, VA. Embassy cultural officer; one of two women hostages. Frederick Lee Kupke, 34, Francesville, IN. Communications officer and electronics specialist. L. Bruce Laingen, 58, Bethesda, MD. Chargé d'affaires. One of three held in Iranian Foreign Ministry. Steven Lauterbach, 29, North Dayton, OH. Administrative officer. Gary E. Lee, 37, Falls Church, VA. Administrative officer. Sgt. Paul Edward Lewis, 23, Homer, IL. Marine guard. John W. Limbert, Jr., 37, Washington, DC. Political officer. Sgt. James M. Lopez, 22, Globe, AZ. Marine guard. Sgt. John D. McKeel, Jr., 27, Balch Springs, TX. Marine guard. Michael J. Metrinko, 34, Olyphant, PA. Political officer. Jerry J. Miele, 42, Mt. Pleasant, PA. Communications officer. Staff Sgt. Michael E. Moeller, 31, Quantico, VA. Head of Marine guard unit. Bert C. Moore, 45, Mount Vernon, OH. Counselor for administration. Richard H. Morefield, 51, San Diego, CA. U.S. Consul General in Tehran. Capt. Paul M. Needham, Jr., 30, Bellevue, NE. Air Force logistics staff officer. Robert C. Ode, 65, Sun City, AZ. Retired Foreign Service officer on temporary duty in Tehran. Sgt. Gregory A. Persinger, 23, Seaford, DE. Marine guard. Jerry Plotkin, 45, Sherman Oaks, CA. Private businessman visiting Tehran. MSgt. Regis Ragan, 38, Johnstown, PA. Army noncom, assigned to defense attaché’s officer. Lt. Col. David M. Roeder, 41, Alexandria, VA. Deputy Air Force attaché. Barry M. Rosen, 36, Brooklyn, NY. Press attaché. William B. Royer, Jr., 49, Houston, TX. Assistant director of Iran-American Society. Col. Thomas E. Schaefer, 50, Tacoma, WA. Air Force attaché. Col. Charles W. Scott, 48, Stone Mountain, GA. Army officer, military attaché. Cmdr. Donald A. Sharer, 40, Chesapeake, VA. Naval air attaché. Sgt. Rodney V. (Rocky) Sickmann, 22, Krakow, MO. Marine Guard. Staff Sgt. Joseph Subic, Jr., 23, Redford Township, MI. Military policeman (Army) on defense attaché's staff. Elizabeth Ann Swift, 40, Washington, DC. Chief of embassy's political section; one of two women hostages. Victor L. Tomseth, 39, Springfield, OR. Senior political officer; one of three held in Iranian Foreign Ministry. Phillip R. Ward, 40, Culpeper, VA. Administrative officer. Richard I. Queen, 28, New York, NY. Vice consul. Robert Anders, 34, Port Charlotte, FL. Consular officer. Mark J. Lijek, 29, Falls Church, VA. Consular officer. Cora A. Lijek, 25, Falls Church, VA. Consular assistant. Henry L. Schatz, 31, Coeur d'Alene, ID. Agriculture attaché. Joseph D. Stafford, 29, Crossville, TN. Consular officer. Kathleen F. Stafford, 28, Crossville, TN. Consular assistant. Kathy Gross, 22, Cambridge Springs, PA. Secretary. Sgt. James Hughes, 30, Langley Air Force Base, VA. Air Force administrative manager. Lillian Johnson, 32, Elmont, NY. Secretary. Sgt. Ladell Maples, 23, Earle, AR. Marine guard. Elizabeth Montagne, 42, Calumet City, IL. Secretary. Sgt. William Quarles, 23, Washington, DC. Marine guard. Lloyd Rollins, 40, Alexandria, VA. Administrative officer. Capt. Neal (Terry) Robinson, 30, Houston, TX. Administrative officer. Terri Tedford, 24, South San Francisco, CA. Secretary. Sgt. Joseph Vincent, 42, New Orleans, LA. Air Force administrative manager. Sgt. David Walker, 25, Prairie View, TX. Marine guard. Joan Walsh, 33, Ogden, UT. Secretary. Cpl. Wesley Williams, 24, Albany, NY. Marine guard. Capt. Richard L. Bakke, 34, Long Beach, CA. Air Force. Sgt. John D. Harvey, 21, Roanoke, VA. Marine Corps. Cpl. George N. Holmes, Jr., 22, Pine Bluff, AR. Marine Corps. Staff Sgt. Dewey L. Johnson, 32, Jacksonville, NC. Marine Corps. Capt. Harold L. Lewis, 35, Mansfield, CT. Air Force. Tech. Sgt. Joel C. Mayo, 34, Bonifay, FL. Air Force. Capt. Lynn D. McIntosh, 33, Valdosta, GA. Air Force. Capt. Charles T. McMillan II, 28, Corrytown, TN. Air Force. This list was adapted from information in Free At Last by Doyle McManus. 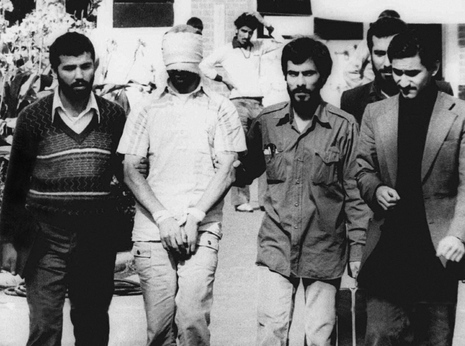 On November 4, 1979, 53 Americans were taken hostage by militant Iranian "students" at the American Embassy in Tehran, Iran. Thus began a period of 444 days in which these Americans were held captive. That same day, the highest levels of the United States government made a commitment to return the Americans to freedom. It was decided that a combination of helicopters and specialized airlift aircraft would be used to accomplish the planned rescue mission. The military assembled a rescue team comprised of highly skilled personnel from all four military services. All of the men, both aircrew members and the assault force, were volunteers. By the end of November, these men began training at a desert site in the western United States where the terrain and climate were similar to those of Iran. By December, all the various mission components were being integrated into a cohesive rescue force. As training progressed, the operational plan was to use a remote site well away from Tehran to refuel the helicopters carrying the rescue force for the planned mission. This site became known as Desert One. Rigorous training and exacting mission practice continued through January, February, and March. Training demands were considerable. Total secrecy was demanded, so special procedures under conditions of radio silence had to be rehearsed and special night visual devices employed. The men's confidence grew, and their readiness was constantly evaluated. At the end of March, the rescue force was alerted to be ready to execute the mission on short notice. The President gave the authority to launch the mission on the night of April 24, 1980, when visual illumination and weather appeared most favorable. At dusk that evening, eight RH-53 Sea Stallion helicopters took off from the deck of the aircraft carrier Nimitz. Their mission was to fly in darkness at low altitude, in formation, across hostile Iranian territory and rendezvous with the special C-130 aircraft at Desert One. A total of six C-130 aircraft had already departed another location for Desert One. The mission was about two hours old when the first trouble occurred. Because of severe mechanical problems, one helicopter was forced to land and transfer crew and equipment to another helicopter. A short time later, the C-130s followed by the RH-53s encountered an unexpected dust storm that dangerously degraded visibility and made navigation nearly impossible. As a result, a second helicopter aborted the mission, reversed its course, and returned safely to the carrier Nimitz. The C-130s arrived first at the Desert One refueling site followed by the six remaining Sea Stallion helicopters. Unfortunately, a third helicopter had developed a hydraulic problem enroute to Desert One. The mission plan required a minimum of six operational helicopters to continue after the planned refueling. With this third helicopter out, the decision was reluctantly made to abort the rescue mission. Preparations were begun to complete the refueling of the helicopters and evacuate the site at Desert One. 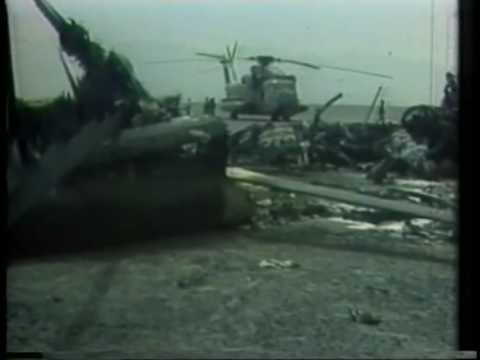 Tragically, while an RH-53 helicopter was being repositioned on the ground, its rotary blade struck the fuselage of a C-130, setting the two aircraft ablaze. Though courageous efforts were made to save lives, three Marines in the helicopter were killed, and five Air Force crew members died on the C-130. 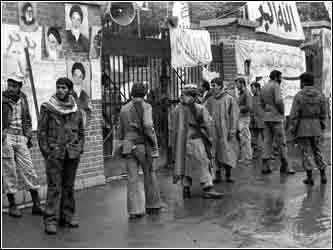 November 4 is the 30th anniversary of the siezure, by young Iranian militants, of the U.S. embassy in Tehran. Leading up to that event, the Ayatollah Ruhollah Khomeini had returned to Iran from exile in France, leading an Islamic revolution that forced the Shah of Iran to flee. Fifty-two of the US diplomats seized by the Iranians were held captive for more than a year, most of them at the US embassy. On November 4, 1979,the United States embassy in Tehran was seized by militants in the name of Iran's new leader, Ayatollah Ruhollah Khomeini. For the next 444 days, it was the scene of captivity for 49 Americans, including embassy Press Attache Barry Rosen. He describes how he was taken hostage. "One young man, looking rather ferocious at that time, started to kick, to kick the door down," he says, "This person said to me in a loud voice, in Farsi, "You are under arrest! You are a member of the nest of spies! You are going to come with me!" The Acting US Ambassador at the time, Bruce Laingen, was also taken hostage. In hindsight, he says, the close U.S. relationship with the Shah of Iran, widely unpopular, set the stage for what happened. "If we had done things differently, you could come up with all kinds of scenarios. But I believe myself that it was almost inevitable," Laingen said. A celebration in Algiers on November 1st, where Iran's Prime Minister Mehdi Bazargan was photographed meeting with U.S. National Security Advisor Zbigniew Brzezinski, pushed the situation over the edge, according to Victor Tomseth, who was a political officer at the embassy. "I'm convinced to this day that it was that picture that was the catalyst for the student group that carried out the attack on the embassy," Tomseth said. The U.S. diplomats spent nearly 15 months confined in the embassy, the foreign ministry and other Tehran locations. In the U.S., Americans hung yellow ribbons to show solidarity, also putting pressure on President Jimmy Carter to act. Months later, the US mounted a rescue mission. A dust storm turned the operation into a disaster, killing eight servicemen. The mission was aborted. Barry Rosen says the U.S. made several mistakes, including not closing the embassy after an earlier takeover attempt in February 1979. "We should have shut down the embassy after February 14th. And said to the Iranians 'When you want us back, we will be back,'" he states. Bruce Laingen says decisionmakers in Washington weren't paying attention to the detailed reports the embassy was providing about the deteriorating situation in Iran. Washington was paying attention to the Cold War and Moscow, according to Rosen. "We are still worried about the Soviets. We had listening posts in the embassy. That to the administration was more important than bilateral relations or the bodies [the embassy personnel] that were in Tehran," Rosen said. Bruce Laingen says he spoke with Foreign Minister Ebrahim Yazdi late on November 4 about the situation. "I had a telephone conversation that night, of the first day, when he told me 'Look. We will resolve this by morning.' And I said to him, 'OK, what am I going to do?' What are you going to do with me? And he said 'Why don't you go down into the diplomatic reception rooms [at the Foreign Ministry] and find a place to sleep there?" Laingen recalls. It was a nap that lasted nearly 15 months. In November 1980, President Carter lost his re-election bid. On January 20, 1981, Ronald Reagan was inaugurated as President of the United States. On the same day, Bruce Laingen and 51 other Americans were freed. Some 30 years later, the United States and Iran are still at odds.